I arrived to class on Monday, November 27th, 2006 anxious and ready to be frustrated once again. I had ambivalent feelings about the course. Of all my courses at Eugene Lang College, this “America Project” class was the most culturally diverse. Where I was usually the lone black male student, here I was joined by several black and latinx peers. Still, I’d come to learn that cultural diversity didn’t automatically translate into meaningful and enriching conversations on identity, race and power. I’d been initially attracted to the learning about America’s “guiding mythologies” and dissecting what it meant to be an engaged citizen in a post 9/11 nation. But I’d come to resent the amount of time spent in class scouring over the American Constitution and the Declaration of Independence. This was The New School, I reasoned: surely the class would have a more progressive and radical spin. 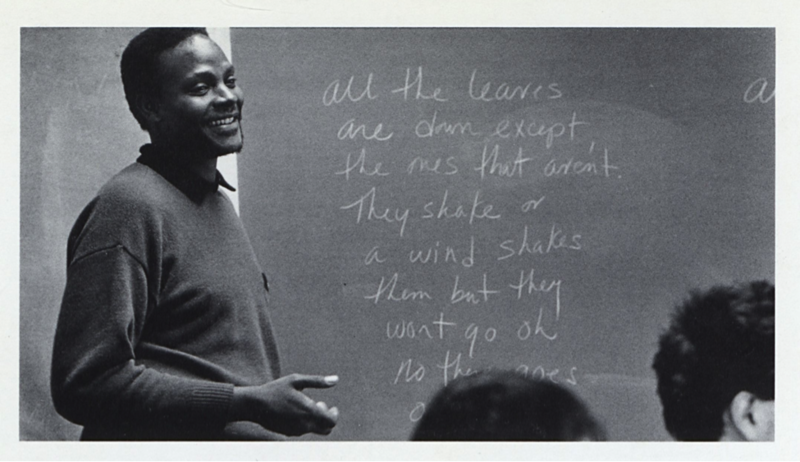 I’d been drawn to the class because of the larger than life reputation of its professor, Sekou Sundiata, a progenitor of the black arts movement known for his radical art and activism. But what surprised me was how Sekou stepped back. This day would be no different. Over the weekend, Sean Bell, a 23-year-old unarmed black male had been killed by New York City Police. While the facts were still coming in, seeing Sean Bell’s face plastered all over the city’s newspapers had a profound impact on my psyche. Just 3 months earlier, when visiting my hometown of Chicago over the summer break, I’d experienced a run-in with undercover police officers. I felt as if I was living in a parallel universe to Sean Bell, yet I’d somehow emerged with my life intact while he was not so fortunate. I walked into class that day carrying this trauma. In addition to the readings and notebooks in my bookbag, I struggled to carry the baggage of my race and identity. It was the “skin I was living in” Sekou described in his spoken word piece Blink Your Eyes. My brown skin, usually a source of pride and signifier of my African diasporic roots, today felt like a burden. I was acutely aware that my fate could be tied to what happened to Sean Bell. But I’d envisioned that this course could transform that day into a paradise of healing where I could begin to make sense of all of the anger and frustrations that I’d built up over my 20 years of living as a black man in America. There was a tension noticeable as soon as I entered the room. Students of color and our white allies were all attuned to the news of Sean Bell. We’d been reading about it and following the protests. Several students of color came from New York and for them it felt the most visceral. We hugged each other and tried to hold back tears. But for the most part, other than the handful of allies mentioned, the white students in the class did not appear to be aware of or impacted by Sean Bell’s death. For them it was a typical Monday. Sekou entered the room and began the lesson. Today we would be reading and discussing an essay by Jacob Needleman about “rediscovering the wisdom of the founders.” As Sekou asked us to get ready to discuss our readings, my side of the room grew visibly upset. Only 5 minutes into class moans and groans could be heard. Finally one student raised her hand. “I’m sorry but we’re not even going to acknowledge what happened this weekend?” Sekou froze and flashed an apprehensive yet subtle grin. “Yes, why don’t you share with the class what’s on your mind.” The student launched into a monologue, not just about Sean Bell but about the overall lack of value assigned to black life. She mentioned that this incident had merely been another one of many, except that this time it had happened right in our backyard in Queens, NY. She implored us all to wake up and pay attention to what was happening around us. She didn’t understand how we could talk about something as tone deaf as the “wisdom of the founding fathers” at a time like this. All of the POCs and allies, nodded our heads in acknowledgement. Sekou watched and listened but did not respond. For a few moments it was quiet. Another student, latinx, broke the silence: “I have an idea. Since this is a class about making art out of our experiences, why don’t we dramatize all of American history from the point of view of the oppressed and make it about the fight against our oppressors.” Sekou smiled widely, neither affirming this loaded suggestion nor shutting it down. His body language clearly deflected the question back to all of us students. Sekou faced us, on the edge of his seat waiting to hear what we would say. Finally one white student spoke. “I don’t like that idea. So the only place in that story for me would be one of evil and wrongdoing?” “No, not at all,” the latinx student replied, “I mean of course we will be the stars in it, but you know some of you will be oppressors and others can be our allies or something.” Sekou let out a hearty laugh and a few students joined in. I was confused. This didn’t feel like the healing I’d sought. In that moment I was silent, and despite a few of our protestations, class continued as usual. I went to Sekou’s office hours a few days later and expressed my frustrations about that class. Why hadn’t he said more, done more? Didn’t he empathize with us students of color? And why was he still pushing for understanding of the Constitution and connecting our work to the beliefs of America’s slave-holding founding fathers? As I reflect back more than a decade later, I realize that my frustrations in Sekou’s course were instrumental to the masterful methodology he’d crafted. 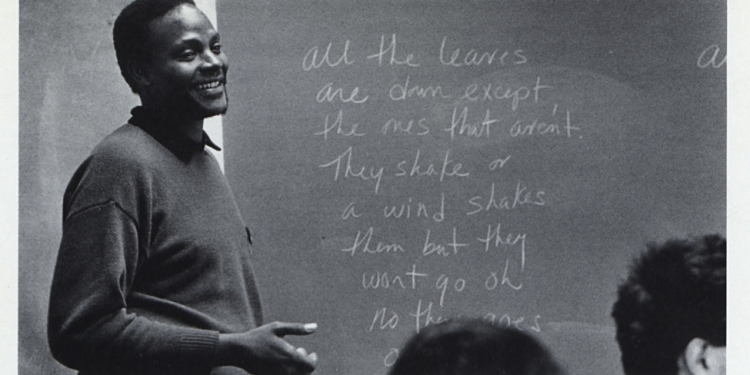 Sekou had devised a unique and innovative pedagogy linked to artistry and civic engagement which he termed “making as a way of thinking.” Sekou believed that it was important to tackle problems so big they seemed insurmountable. When approached from a collaborative rather than solitary perspective, the frustration and struggles that ensued had the power and potential to unlock greater meaning and substance in our artistic and academic endeavors. Powerful art could inspire and instigate us to tap our imaginations, to see each other more fully and come closer to fulfilling our society’s democratic ideals. Sekou used a signature in all of his emails: “All of a Sudden.” He told me once that it was a phrase he felt captured the essence of Camus’ invocation to “create dangerously.” It signified for him the ways teaching should be improvisational, and that we should always be ready to pivot and lean in to new mental spaces and imaginings together. For Sekou’s America Project, this meant seeking to understand what it meant to be an engaged citizen in a post-9/11, American imperialist world. For more than a year leading up to the debut of his 51st Dream State performance at BAM, Sekou had traveled the country speaking to professors, artists and people of many faiths, political leanings and cultural backgrounds. He hosted “citizenship dinners” and “WeDaPeople’sCabaret’s” where he encouraged folks to dig up deeply personal narratives around their uniquely American experiences and then pushed them to share and dialogue across their differences. Sekou then melded these perspectives with his own to create an awe-inspiring work of art. Those of us who were privileged to be in his America Project class were also invited to his expansive performance of 51st Dream State. He encouraged us to write and talk back to the issues that came up for us and ultimately worked with us to develop our own documentary theater piece in response to his work — an iteration of the idea the latinx student had proposed the day after Sean Bell was murdered. This feedback loop was meant to strengthen our artistic processes, as well as build community and ultimately fortify democracy. Sekou Sundiata passed away before he was able to witness the ascendance of America’s first black president. I watched President Barack Obama weave in and out of issues around race and empire. Especially when Trayvon Martin was killed by George Zimmerman and the president responded that “it could have been [him] when [he] was younger,” I had a deep yearning to know how Sekou would have responded. I can only speculate, but I’m almost certain he would have kept pushing us to seek the right questions rather than the correct answers, risking frustration in learning to see each other as more fully human. Brian Lewis is an Adjunct Professor at the New School’s Eugene Lang College and also teaches courses for NYU’s Robert F. Wagner Graduate School of Public Service. He holds a B.A. in Education Studies and Literature from The New School and an M.A. in Urban Education from the CUNY Graduate Center. He is currently the Deputy Director for Programs at exalt , the first program in NYC designed for and exclusively serving justice system-involved youth in which they participate on a voluntary basis.